NSW Government: Sydney’s new metro railway is a step closer after meeting two major milestones deep underground. 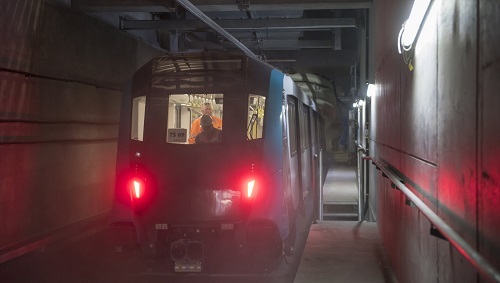 The first metro train has entered the new Sydney Metro tunnels in the city’s north west, and three new underground metro railway stations have been “topped off” with work rising to ground level from 25 metres deep underground. Premier Gladys Berejiklian welcomed the major metro milestones. “I’m very excited to see this progress which shows we’re well on our way to opening Sydney’s fast, easy and reliable metro railway next year,” Ms Berejiklian said. The train testing took place in the first two kilometres of tunnels between the new Bella Vista and Norwest stations. Onboard systems were tested as well as signalling, braking and acceleration at different speeds in the tunnel. Testing will progressively increase up to 100km/h. Minister for Transport and Infrastructure Andrew Constance said the much anticipated tunnel test was a resounding success. “Sydney’s new metro train passed this crucial milestone with flying colours,” Mr Constance said. More than 10,000km of train testing has taken place so far on the Sydney Metro system, with 12 of the fleet of 22 trains delivered. In further project milestones on Sydney Metro Northwest, major construction work at the new Hills Showground, Norwest and Castle Hill stations has reached ground level – having started from 25 metres below the surface. This is the equivalent of an eight-storey building underground. Nearly 25,000 tonnes of concrete and 1200 tonnes of reinforced steel was used to deliver the new metro platforms and station concourse area at Hills Showground. Work is also continuing on the new commuter car park, which will have 600 spaces. The next step is the installation of the iconic station canopy, its design inspired by the local blue gum leaf. Sydney Metro opens in the city’s north west in the second quarter of next year – 13 metro stations, 4000 commuter car parking spaces and 36km of new metro rail. When metro rail is extended into the Sydney CBD and beyond to Bankstown in 2024, Sydney will have 31 metro stations and a 66km metro railway.